The trainer who has been charged with lying about what happened to former New England Patriots star Jerod Mayo's dog has claimed she did not cause his death. 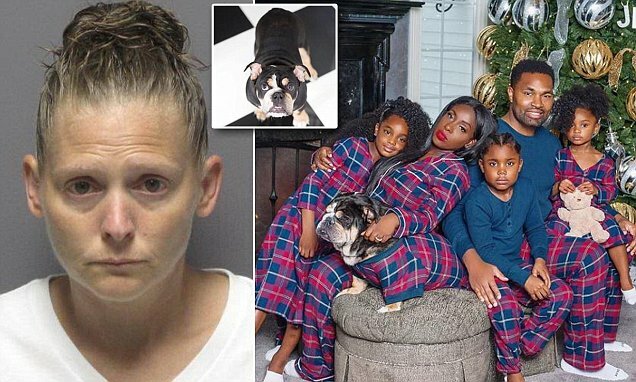 Amelia Ferreira, 41, was charged with one count of obstruction of justice after Mayo's five-year-old English bulldog was found dead inside a trash bag at her home. The discovery came more than a month after Ferreira told police that the dog, named Knox, had run off during a walk. Ferreira is now speaking out for the first time, calling herself a 'coward' for 'not being honest' about what happened to the poor pup. 'I don't know why Knox died and it eats at me every day that his family is still left not knowing what caused his death,' she told The Sun Chronicle. Ferreira left Knox in a crate in a room with air conditioning at her home in Cranston, Rhode Island on June 22. When she returned four hours later after training another dog, Ferreira went to feed Knox and discovered that he was dead. Ferreira said she was scared to tell the Mayo family what had happened to their beloved pup and found that 'lying was easier'.